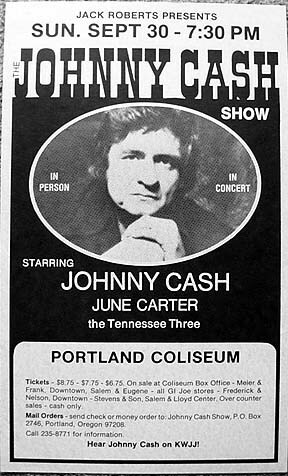 JOHNNY CASH - Rare Concert Posters of the 60's and 70's - PosterGeist! 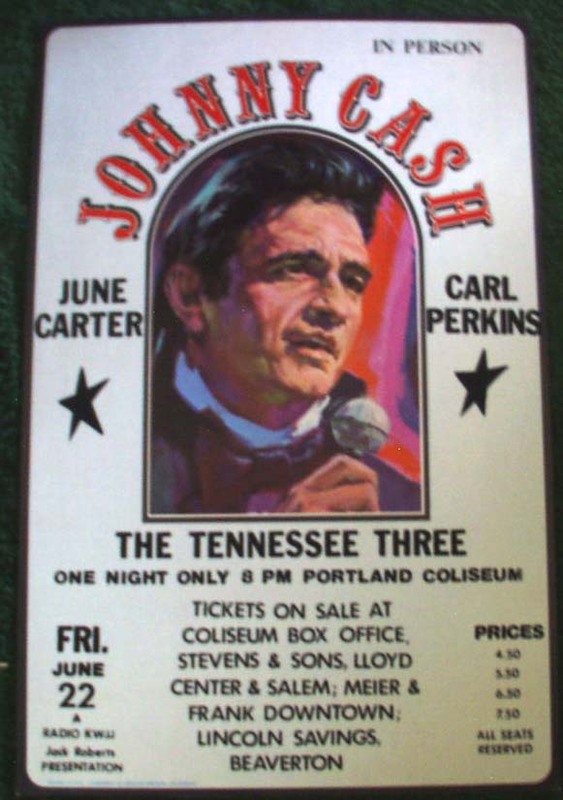 JOHNNY CASH - JUNE CARTER - CARL PERKINS - Fri, June 22, 1973 at Portland Coliseum (Oregon) - First / Only Printing concert poster - 13 5/8" x 20 3/4" - Gorgeous illustration / painting of Johnny with microphone in hand, in full color - Very small print run for this venue, due to the expensive window card stock (thick cardboard like material) - I've seen five copies in the 9+ years I spent hunting concert posters in the Portland area! - Ultra Mega Rare - Pristine A- copy - Inquire for Current Price / Availability - 2nd copy in Beautiful B- shape (has a stain at bottom edge, difficult to see in a frame!) - Inquire for Current Price / Availability - Photo was taken in poor light, background color is even and image is in focus on actual poster!